Akzo Nobel is to sell Crown paints as part of its deal with the European Commission to secure clearance of its acquisition of ICI, which owns Dulux. It is selling manufacturing sites and warehouses in Darwen near Blackburn, Hull, Warrington, Belfast and Dublin. 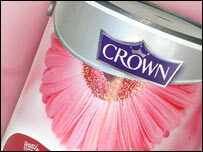 Its network of Crown Decorator Centres and brands such as Crown, Permoglaze and Sandtex will also be sold. The Commission was concerned that without the sales, Akzo would get too dominant a position in UK paints. "We will be making every effort to ensure that these excellent businesses are transferred to the most appropriate new owners who will build on the successes that these activities have already achieved, said Hans Wijers, chief executive of Akzo Nobel. The European Commission has now cleared the merger, as have the US Federal Trade Commission and the Canadian Competition Bureau.